While some developers look to go higher and higher, there is also a growing camp with an increasing demand for longer, column free spaces; structures which either provide maximum flexibility for the interiors or the perfect, unobstructed spectator view. From aircraft hangars to stadium and arena roofs, long spans demand close attention to unbalanced loads caused by wind pressures, snow drifts or construction materials acting on the roof or loads hung from roof framing. Construction of these structures becomes complex and a significant driver of both cost and schedule. Achieving economical long-span building structures requires a deep understanding of the key relationships among framing concepts, construction sequences, fabrication processes and erection methods. “You really need to think from first principles, and be brave. 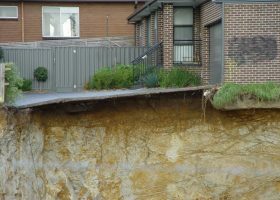 Designing something that might deflect 500 millimetres under dead load and move up to a metre under wind loads means you really need to understand how the structure will behave and the implications on secondary elements,” said Aurecon technical director Mark Sheldon. A structure with a span larger than 20 metres can be regarded as long span as it is usually unable to be achieved by an ordinary reinforced concrete structure. The most common material used for long-span structures is steel due to its light weight, high strength to weight ratio, ease of fabrication and erection, and cost. The choice of the cladding material also plays an important role. In principle, this should be as lightweight as possible, hence the use of tensile fabric in many of new modern stadia. Tension membrane structures combine elegant forms with cost efficiency, performance and function, but they also provide a unique engineering challenge. The engineer must design a structure whose form is determined not only by the vision of the architect but also the forces within the fabric. Combining the structure and cladding into one has proved cost competitive with conventional roofing, while additionally providing reduced noise and exceptional lighting characteristics. In addition, the lightweight nature of tension membrane structures, as opposed to conventional roofs, allows rapid erection and relocation. In terms of earthquake engineering, the lower mass means potential cost savings to the overall seismic stability of the supporting structure. Wind engineering is also fundamental. “A wind tunnel analysis is essential to optimise the design of long span structures. 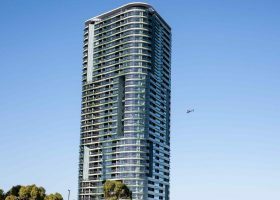 Using a normal code-based design approach could add over $1million to the cost of a structure due to the lost opportunities to optimise the structure using reduced loads,” said Sheldon. Sheldon’s colleague Garth Rowland agrees. “The Australian wind code was not designed for the variety of stadia roof forms that we see nowadays and even where it can be applied the results can be conservative. Wind engineering adds certainty in design loads which improves the structural understanding and facilitates reductions in steel tonnages from those based on code pressures,” he said. The Dome of Hagia Sophia in Istanbul, built in 535 A.D. was the longest span roof in the world for approximately 1,000 years. Nowadays, from the roof of AT&T Stadium, home of the Dallas Cowboys, to Pulkovo Airport in St Petersburg, a new breed of long-span structures is emerging. In terms of the building envelope of Pulkovo Airport, engineered by Ramboll, the main function was to provide a barrier from the extreme climate variations outside the main terminal building. The roof has a flat external surface to minimise the effect of snow loads, allowing a complex faceted internal soffit geometry. The roof soffit was folded in key places to maximise structural efficiency, removing weight in the clear spans, while defining expansive open spaces through variations in height. The faceted soffit for the main terminal roof created an interesting challenge to shape the form to maximise structural performance, and to utilize the space created inside the soffit as efficiently as possible. Planar trusses were chosen to aid the buildablity, as they could be preassembled, simplifying the connections details and reducing piece count against space frame options. “The huge external temperature range in St. Petersburg posed many questions on how to deal with movement across the main terminal roof; we developed a solution which eliminated the need for any movement joints over the 160 metre by 240 metre roof. This balanced the allowable movements at the façade against locking in thermal stresses into the roof structure. The unique solution was to place the roof on bridge bearings to have full control over the movements and points of lateral restraint,” explained Kevin Hares at Ramboll. The rise of digital modelling and design has been integral to boundaries being pushed. “Geometric forms and networks that would not have been feasible to achieve say 20 years ago can now be realized,” said Campbell. In innovation terms, a team of architects and engineers in Singapore has developed a unique low-cost, lightweight technology. Known as Cloud Arch, it makes innovative use of fire-resistant structural foam that is quick to install and could change the way open public spaces such as markets, airports, stadia, concert halls and factories are designed and constructed. “Cloud Arch is the clearest representation of a new trend which is pioneering radical changes in structural engineering where we study materials with high strength and low density which efficiently optimise their structural applicability,” said Dr. Hossein Rezai, director of Web Structures. He says the Cloud Arch team has been inspired by a number of other cutting-edge approaches being developed around the world. The first one is a system now being used in Vietnam, it consists of 3D expanded polystyrene (EPS) wire construction panels and uses a steel 3D mesh as structural supporting system and EPS panels as central core to achieve light weight, insulation and fire protection. The second project is the Novartis Project in which the glass-fibre-reinforced plastic (GFRP) roof is made of 460 GFRP-wrapped polyurethane foam cores of various densities. Their vertical faces create internal webs that, in combination with the face sheets, form the load-bearing structure. GFRP laminates are added in several steps in hand lamination, thereby creating ever larger pieces: from individual blocks to block strips and finally to four large roof elements. Another benchmark is a small project in Tanzania where EPS panels strengthened by steel reinforcement and concrete wall plaster have been used in place of typical walls in a small villas development. So is there a limit to how long we can go? Interesting as engineering feats – but in all honesty, how much longer do these structures need be?